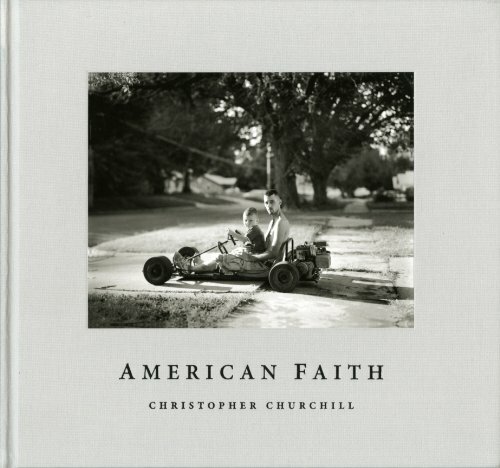 Christopher Churchill’s debut monograph 'American Faith' offers a unique perspective into the collective nature of the word 'faith.' It explores the way both secular and non-secular individuals address the basic need to be connected to something greater. Churchill approaches this task without dogma or judgment; his travels steer us through brothels, mega churches, and into living rooms, always with honesty and respect for the subjects. Interspersed we find quiet, expansive landscapes that give a geographical context to the scope of the project. Using an 8 x 10-inch view camera, Churchill manages to depict an intimate presence with each photograph. The individual portraits are paired with interviews of the subjects. We find at the end a beautiful and deep commonality in the way that individuals search for a voice and meaning to their lives. Christopher Churchill’s works are held in many public collections including The Center for Creative Photography; The Corcoran Gallery; The J. Paul Getty Museum; The Museum of Fine Arts, Boston; and the Museum of Fine Arts, Houston. This first printing of American Faith is limited to 1,000 casebound copies. Produced and distributed by Nazraeli Press for JGS, Inc.